I made something of an event of reading The Girl Who Raced Fairyland All the Way Home by Catherynne M. Valente. It’s not every day (or year) that I read the final book in the best series I’ve encountered in…probably a decade. I’ve heard it said that you’ll never love a book you meet as an adult with the same devotion that you loved beloved books met in childhood, or in the passionate teenage years. I find new books to love every year, but Fairyland is the only series that really does approach the same level as, say, the Song of the Lioness (mainstay of my childhood) or L. M. Montgomery en masse (because all her books feel kind of like one series). So it was no small matter, reading the final book. I reread all four of the previous books (Circumnavigated, Fell Beneath, Soared Over, and Boy Who Lost) over the span of a couple weeks, and I read with a pencil in hand. I virtually never underline or highlight books I read, and on the rare occasion when I do, it’s virtually always nonfiction and some variety of philosophy (casting the philosophy net wide enough to include both Thoreau and Brene Brown). But I reread Fairyland and underlined sentences and paragraphs that were insightful, or deeply clever, or just gorgeous writing–and I probably averaged one to two underlinings per page, for all four books. They really are that good. And then I approached book five, The Girl Who Raced Fairyland All the Way Home. And it thoroughly lived up to all the books that came before it. Lots of underlining going on here too. 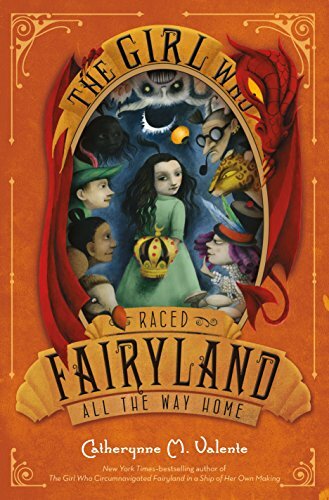 It’s hard to talk about the plot without spoilers–so suffice to say that September and her friends are in a race for the crown of Fairyland, against all Fairyland’s past rulers. But it’s not a simple race. It’s a race hardly discernible from a quest, with an occasional foray into magical dueling, and no shortage of strange creatures and obstacles and mix-ups along the way. It’s basically all just a delight. It’s charming and funny and tense, sometimes one or the other and often all of the above. Our girl September is back after her one book hiatus and in fine form, older and more mature and more confident than in earlier books but still definitely not having all the answers or always making the right decisions. Old friends A-Through-L and Saturday are loyal and steadfast and such fun, and new friend Blunderbuss the Wombat is simply brilliant. As a final book should, all sorts of characters and happenings and references from earlier books come up or tie off here, but there’s plenty of new things to make it a properly new adventure too. Old enemies and new enemies both appear. Some of the former rulers of Fairyland are truly nasty, but dueling with insults or Latin grammar make for some fantastically brilliant and bizarre fights. I don’t think it’s a spoiler to say it all ends happily, because of course it had to. There is a clever twist at the end, though, one I didn’t anticipate even though it was all set up. A few aspects of the end are slightly deus ex machina, though I’m not sure you can really say that when it was set up (albeit in a side thread) for a book and a half. And besides, the ending is very much in the classic fantasy tradition (at least, if you read far enough in The Wizard of Oz series). This is my last magic trick, the curious wizardry of narrators. Come close, and I will whisper it, and then we shall have cocoa. Endings are rubbish. No such thing. Never has been, never will be. There is only the place where you choose to stop talking. Everything else goes on forever. I will always be here, in my old chair by the door, waiting for you, whenever you are lonesome…For as long as forever, I will keep a room for you. I am finding a strange lack of reviews! Anyone…? I haven’t read any of these books but I love that sweet ending with the promise that the reader can always come back and re-read again. That’s really beautiful!